See all of the lineups, comparisons and callouts for each class, posing by the top 5s, and all awards through to the OVERALL AWARDS. The 3 outstanding OVERALL WINNERS were – Men’s Bodybuilding: Paul Poloczek from Germany, Men’s Classic Bodybuilding: Svetozar Milenkovic of Serbia and Master Men’s Bodybuilding: Ahmed Fauzi from Switzerland. 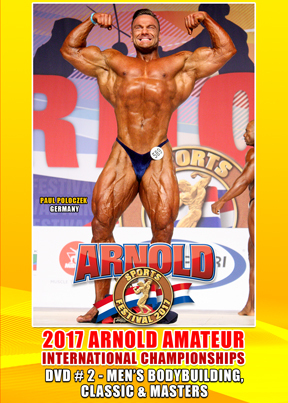 The 3 outstanding OVERALL WINNERS were – Men’s Bodybuilding: Paul Poloczek from Germany, Men’s Classic Bodybuilding: Svetozar Milenkovic of Serbia and Master Men’s Bodybuilding: Ahmed Fauzi from Switzerland. MEN’S RESULTS AS SEEN IN THIS DVD. 5. Jose Ramon Tineo Martinez Dominican Rep.